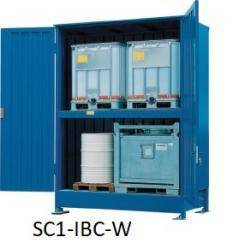 External drum storage cabinet with integral sump and sliding doors, manufactured in accordance with PPG 26 regulations as per the requirement of the Environmental Agency. These cabinets are ideal for storing drums directly inside the container. Cleverly designed to maximise the internal storage space with minimal external space. 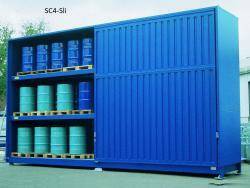 Our range of cabinets are designed to accomodate upto 72 x 205 Ltr drums stored on chemical pallets or placed directly on the floor grid. 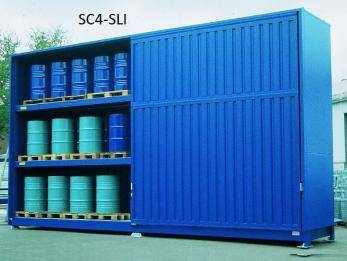 Varying sump capacities are available upto 4000 Litres. Space efficient sliding doors are fitted as standard.